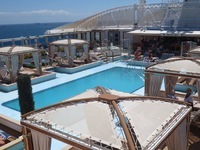 The boat has 2 main restaurants which are for any time dining. Symphony and Concerto. One on deck 6 and the other on deck 5. They are both the same. But for some reason everyone goes to Concerto on deck 6. You always have to wait for a table where one deck down Symphony you can get a table straight away. There is also a seated Pizza restaurant. Great pizzas. The music bands were a bit disappointing. Everything on board is very expensive. Large good buffet selection. The retreat is a great adult only pool area which is free to use. Cartagena We printed some maps before our cruise. The ship docks directly in the town so you can walk straight into the town. It was very hot to look around. So we got a taxi to the nearest beach which is shingle. This cost 20 euros return. I would not recommend this as the beach has no sun beds or umbrellas. Gibraltar Before the cruise we booked online Dolphin Adventure boat and cable car ride. The cost was £27.00 per person for both experiences. This is so much cheaper than through the cruise ship or paying when you get there. Word of warning the cable car to the top of the rock in August wait without a ticket is 3 hours. If you pre book it is 1.5 hours. We realised we did not have enough time to wait for the cable car and had to use a taxi instead. Dolphin Adventure were so good they refunded our cable car tickets. The taxi return to the top of the rock is £25 per person. This includes 3 stops, a cave, the monkeys and the tunnels. If you don&apos;t want to queue this is your best option. To get to the entry to the cable car is a 25 minute walk from the ship. To get to the dolphin boat it is 15 min walk from the ship. The dolphin experience was very good. The trip takes about 1 hour. We saw lots of dolphins they come very close to the boat. Marseille The ship docks about 30 minutes away so we had to use the ships shuttle which is 16 euros return. The shuttle drops you near the petite train ( which is a road train) there are 2 different routes that you can takes. It is a good way to see the sights. It is about 11 euros each. Genoa We went to Portofino via the train. To get there you walk from the ship to the station, which is about 10 mins. There you buy a ticket to Santa Margarita. It is about 16 euros return. The trains can be busy and hot early in the morning. It takes 1 hour. When you get to Santa Margarita walk to the ferry. The ferry takes you to Portofino. The ferry takes about 10 minutes. Florence We booked the ships excursion &apos;Florence on your own&apos; we had 6 hours free time. For us this was too long. In August when the temperature are in the 40s. Taxis are very expensive and the ship does not dock near the station. This is why we booked the excursion. Rome We were transferred to the airport but then we had a couple of hours so we got the Leondardo Express train into Rome. This train goes directly to Rome in 32 minutes. We then got a ticket to go on the Big Bus company and had a round trip of all the sites. This took 1.5 hours just enough time for us to get to the airport for our trip home. 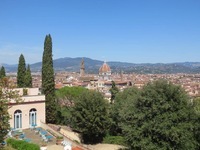 Florence on your own - excursion. 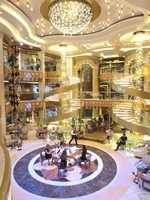 The boat has 2 main restaurants which are for any time dining. Symphony and Concerto. One on deck 6 and the other on deck 5. They are both the same. But for some reason everyone goes to Concerto on deck 6. You always have to wait for a table where one deck down Symphony you can get a table straight away. There is also a seated Pizza restaurant. Great pizzas. The music bands were a bit disappointing. Everything on board is very expensive. The retreat is a great adult only pool area which is free to use. We printed some maps before our cruise. The ship docks directly in the town so you can walk straight into the town. It was very hot to look around. So we got a taxi to the nearest beach which is shingle. This cost 20 euros return. I would not recommend this as the beach has no sun beds or umbrellas. Before the cruise we booked online Dolphin Adventure boat and cable car ride. The cost was £27.00 per person for both experiences. This is so much cheaper than through the cruise ship or paying when you get there. Word of warning the cable car to the top of the rock in August wait without a ticket is 3 hours. If you pre book it is 1.5 hours. We realised we did not have enough time to wait for the cable car and had to use a taxi instead. Dolphin Adventure were so good they refunded our cable car tickets. The taxi return to the top of the rock is £25 per person. This includes 3 stops, a cave, the monkeys and the tunnels. If you don&apos;t want to queue this is your best option. To get to the entry to the cable car is a 25 minute walk from the ship. To get to the dolphin boat it is 15 min walk from the ship. The dolphin experience was very good. The trip takes about 1 hour. We saw lots of dolphins they come very close to the boat. The ship docks about 30 minutes away so we had to use the ships shuttle which is 16 euros return. The shuttle drops you near the petite train ( which is a road train) there are 2 different routes that you can takes. It is a good way to see the sights. It is about 11 euros each. We went to Portofino via the train. To get there you walk from the ship to the station, which is about 10 mins. There you buy a ticket to Santa Margarita. It is about 16 euros return. The trains can be busy and hot early in the morning. It takes 1 hour. When you get to Santa Margarita walk to the ferry. The ferry takes you to Portofino. The ferry takes about 10 minutes. 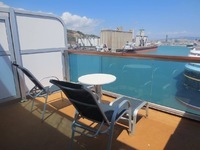 We booked the ships excursion &apos;Florence on your own&apos; we had 6 hours free time. For us this was too long. In August when the temperature are in the 40s. Taxis are very expensive and the ship does not dock near the station. This is why we booked the excursion. We were transferred to the airport but then we had a couple of hours so we got the Leondardo Express train into Rome. This train goes directly to Rome in 32 minutes. We then got a ticket to go on the Big Bus company and had a round trip of all the sites. This took 1.5 hours just enough time for us to get to the airport for our trip home. 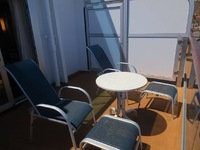 Large deluxe balcony- though the floor did have black soot due to the being at the back of the boat. Two recliner chairs and foot stools and a large patio table. Great views from the back of the ship. Small bathroom with shower curtain. Huge flat screen Tv with all the latest movies. Bring your own shampoo and conditioner unless you are ok with a standard combine one.